Following a series of posts by Tim Nonn and Rob Crilly, today’s contribution comes from Alex Meixner – Senior Director for Policy and Government Relations at Save Darfur. In this quite lengthy post, Meixner deals with the question of how U.S.-based advocates can maintain political strength, as well as the policy question of what that political strength should be used to push for. His section on the first issue looks at how both structural changes, as well as ideological shifts in the Obama Administration as compared to its predecessor, render some of the advocacy approaches needed under the Bush Administration redundant, while also requiring some new approaches to be adopted. His section on policy begins with the unassailable statement that: “While the Save Darfur movement adjusts its strategies and tactics to ensure its political strength, we must also be prepared to update our policy prescriptions lest we waste our hard earned political capital, or worse, become counterproductive. Put simply, all the political strength in the world won’t help anyone in Sudan if we don’t use it effectively.” No one would disagree, but the question is what this means in practice. Given space constraints, Meixner limits himself to addressing this in respect of the U.S.-based view of how the policy options available under the Obama Administration differ from those available under the Bush Administration, in particular regarding Obama’s commitment to extend a hand to an unclenched fist. I have received several emails from different advocates and advocacy organizations this week, indicating that while they are reading with interest, and discussing these issues internally, they are not going to contribute because they are variously too busy/ too uncertain on what their own approach to these issues is and/or concerned about publicly stating their approach for fear of being attacked and/or polarizing the situation further. I understand these concerns. My hope is that through maintaining the (rebuttable) presumption that everyone posting here has the best interests of Darfuris at heart, we can hear each other’s views while avoiding the worst of the potential pitfalls. We shall see. But in any case, my thanks to those who have been willing and able to engage with this site and share their thoughts with the broader public . . . The questions posed – should the Save Darfur advocacy movement shift its policies, strategies, and tactics to better fit the new realities of the Obama Administration, and if so, how and to what degree – are interesting ones, with complicated answers. From my perspective it’s clear that while the Save Darfur movement must constantly be working to be both strong and effective in our advocacy, a special effort is required to adjust to the new political reality of the Obama Administration. Broadly, that means adjusting advocacy strategies and tactics to grow and maintain our political strength within the confines of the new political reality created by the Obama Administration, and constantly reassessing our policy prescriptions as both outside events and trial-and-error dictate. The goal of these adjustments continues to be a Save Darfur movement that is both politically viable in the U.S. and practically helpful to civilians in Darfur and throughout Sudan. I think it obvious to any close observer of U.S. politics that there are significant differences in how policies were formed, prioritized, resourced, and implemented during the last years of the Bush Administration compared to these first months of the Obama Administration. Many of these differences are apolitically structural (a recrafted org chart, new appointees, an inclination towards conducting full-scale policy reviews of various subjects, etc.) while others differences are of a political/ideological nature (preference for greater engagement with unfriendly states, greater reliance on and resourcing for multilateral diplomacy, etc.). This Administration is adopting different strategies and tactics than its predecessor, and it has a different mix of strengths and weaknesses with which it must contend while trying to execute them. Clearly, this demands that the Save Darfur movement at a minimum recalibrate its efforts to better fit the shifting political terrain in order to remain politically relevant, insofar as political relevance is a prerequisite of any effective advocacy effort to help the people of Sudan. To put it simply, if we want to be effective in our mission, we have to be strong politically, and if we want to be strong politically, we have to be smart in tailoring our advocacy to fit the new political reality. Trying to draft an exhaustive summary of all major and minor political/advocacy course corrections necessitated by Pres. Obama’s inauguration would take more time and more room than are practical for a blog post. That said, it is useful to look at a few of the major shifts that mark the stark transition from the Bush political reality to the Obama political reality vis a vis U.S. efforts on Darfur. During the Bush Administration, we were confronted by several inherently political factors which limited the effectiveness and shaped the contours of U.S. action on Darfur. President Bush’s Sudan/Africa team often lacked cohesion and strength within the Administration’s interagency process, lacked credibility with a Democratic Congress following the 2006 elections, and lacked international credibility on human rights issues with key countries in Africa and the Arab world. These were all serious political impediments to U.S. action on Darfur, and they have all to varying degrees been rendered moot by the new reality of the Obama Administration. With regard to the Bush Administration’s cohesion and strength within the interagency process, Save Darfur sought to use its political heft to compel the appointment of an empowered Special Envoy to own and drive the Sudan portfolio. Tactically, this meant pressuring the White House directly and via Congress to fill the leadership gap left by the departure of Deputy Secretary Zoellick, while simultaneously increasing the profile of the Darfur issue overall to ensure that the Darfur policy team had a political wind at their back. Within the new political reality of the Obama Administration, the presence of so many Darfur champions within the highest levels of the Obama Administration – Sec. Clinton, Amb. Rice, VP Biden, and Pres. Obama himself – and the appointment of Gen. Gration as Special Envoy has significantly changed the dynamic. While there are reports of some back-and-forth between Gen. Gration and Amb. Rice on the details of the upcoming Sudan policy plan, all of the existing bureaucratic pieces of the Sudan policy formulation and implementation puzzle seem to be organized under Gen. Gration’s leadership. For instance, the State Department’s Sudan Programs Group (which previously answered to then-Asst. Sec. Frazer, not Special Envoys Natsios and Williamson) has now been renamed the Office of the Special Envoy for Sudan, with a clear hierarchical line of reporting leading to Gen. Gration. 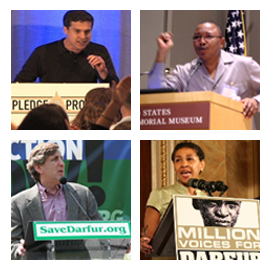 Additionally, while securing Presidential attention on Darfur continues to be a challenge, the existence of a politically relevant Darfur advocacy movement is now assumed, and doesn’t have to be proven from scratch (as was the case during the Bush Administration). Anyone looking for proof of that fact need look no further than the fact that then-Sen. Obama (along with then-Sen. Clinton and Sen. McCain) signed the first presidential candidate joint statement on a foreign policy issue since FDR and Dewey in 1944, and did it on Darfur and at Save Darfur’s request. With regard to the Bush Administration’s ability to work effectively with Congress on Darfur, Save Darfur sought to bridge the gap between a Republican Administration and a Democratic Congress to ensure a full and whenever possible bipartisan U.S. response. Tactically, this meant pushing Congress to support and provide sufficient funding for Bush Administration programs aimed at helping peacekeeping, humanitarian aid, sanctions enforcement, development, and diplomatic efforts in Sudan. It also meant pushing the Bush Administration to submit to Congressional oversight and to acquiesce to important pieces of legislation like the Sudan Accountability and Divestment Act. Thus far in the Obama Administration, there has been no notable rift between the President and Congress on Sudan policy or resourcing issues. The President’s Sudan-specific funding requests within the FY10 State and Foreign Operations bill met our initial targets, and Congress enthusiastically matched or exceeded his requests. When President Obama invited Save Darfur’s President and four of our board members to meet with him and General Gration following Gration’s appointment, it was notable that a bipartisan roster of key House and Senate lawmakers were in the room as well. With regard to the Bush Administration’s inability to coordinate a significant multilateral response to events in Darfur, Save Darfur sought to bolster U.S. attempts to catalyze international action by creating political cover for foreign leaders considering supporting U.S.-led diplomatic efforts to pressure Khartoum. While this may seem an odd focus for a U.S. based advocacy organization, we remain convinced that the U.S. alone cannot solve the crisis in Darfur. Early in our efforts to promote international advocacy, we were informed by polling and analysis that while majorities in many key countries (Arab and African nations with the most regional influence on Khartoum) thought their governments should act in some way to help civilians in Darfur, they would rather their governments do nothing at all about Darfur than join a Bush/U.S.-led effort. Through high-profile events, earned media, paid media (including ads written in local languages and placed in international publications), and private lobbying of international actors, we created the at least partially accurate impression that President Bush’s efforts were being driven by political necessity to appease an unsupportive political bloc, thereby creating room for foreign leaders to justify their potential participation in U.S. backed efforts. To put it simply, we tried to make it easier for skeptical foreign leaders to participate in U.S. led efforts to make peace in Darfur by making it plausibly clear that Bush wasn’t the one driving the Darfur agenda in the U.S. Additionally, we worked with (and in some cases funded) advocacy and civil society organizations in Africa, Europe, and the Middle East, thereby helping to create internal pressure from grassroots and grasstops upon those governments to act. The Obama Administration, on the other hand, starts off with significantly greater international popularity and credibility. While it’s by no means certain that President Obama will actually make the efforts necessary to build an effective diplomatic coalition to address the various crises of Sudan, his failure to do so would not be due to a crippling lack of popularity in the African and Arab world, as evidenced by the warm reception he received during recent speeches in Egypt and Ghana. So in many ways, advocacy strategies necessitated by the Bush political reality no longer require the same degree of advocacy effort in the Obama political reality. The Obama Administration does however bring its own set of political impediments which must be overcome. First and foremost, the global financial crisis is sucking much of the air out of the room, monopolizing President Obama’s time and significantly reducing the level of resources left on the table for discretionary initiatives. President Obama’s efforts on energy, healthcare, and education leave even less room and fewer potential resources. One immediate consequence of these combined factors is the likely difficulty in securing any significant increase in funding for Darfur related programs. While current funding levels are basically sufficient to address current needs, any significant post-conflict development program a la South Sudan will be a tougher sell in this financial environment. In fact, the current levels of funding for peacekeeping, humanitarian aid, and diplomatic efforts only escaped across the board cuts during the recent House consideration of the FY10 State and Foreign Operations funding bill thanks to bold moves by Democratic leadership to break with precedent and disallow almost all proposed cutting amendments. This may be indicative of a new, bolder Democratic majority’s future actions, but majorities can never be counted on beyond the next election, and there’s no guarantee that leadership will continue to go to such lengths to protect the President’s foreign aid budget in the future should the national political winds stiffen in opposition. For the Save Darfur movement, this means that we need to make new efforts to ensure that we are strong in the states and districts of those who could otherwise lead efforts to limit or reduce future funding, namely Republicans and fiscally conservative Democrats. These lawmakers will likely sacrifice U.S. efforts to build a better future for Sudan in the name of controlling government spending unless they have political reasons not to. This requires us to update our mapping of advocacy targets, take proactive steps to build activist infrastructure in key states and districts if it doesn’t already exist, and calibrate our lobbying asks to hit the right targets at the right moments of the never-ending U.S. budget cycle. More Obama Administration weaknesses are sure to arise at he moves further into his presidency, and we must be ready to adopt strategies to address those new factors of the Obama political reality as they appear. Of course, while the new political reality does necessitate some adjustments, many of the fundamental truths, targets, and best practices of issue advocacy remain the same. The fact that I’m not going into detail on our many advocacy efforts which must continue apace does not reflect any lessening of their importance. Save Darfur and through it the Save Darfur movement must continue to maintain and expand our e-activism strength, continue to support and work with the network of committed and entrepreneurial local activists across the country, continue and where necessary expand our partnerships with international advocacy organizations overseas (while the need to create political cover for foreign leaders has lessened, the need for effective foreign engagement has not), continue to work with Darfuri civil society and diaspora, continue our work to garner national and international media attention for Darfur and Sudan stories, and continue our private lobbying efforts. In short, we need to maintain and grow our political strength by adjusting to the new political reality of the Obama Administration where necessary and continuing (and improving) our existing programs everywhere else. While the Save Darfur movement adjusts its strategies and tactics to ensure its political strength, we must also be prepared to update our policy prescriptions lest we waste our hard earned political capital, or worse, become counterproductive. Put simply, all the political strength in the world won’t help anyone in Sudan if we don’t use it effectively. That means constantly assessing and reassessing our policy asks in light of new developments and old fashioned trial-and-error. Since January 20th, any number of major and minor developments have occurred which have necessitated serious thought as to their implications and the best way to move forward, not least of which were the March 4 issuance of an arrest warrant for President Bashir by the ICC and Bashir’s same day decision to eject 13 international aid organizations from Darfur and shutter 3 more. In an effort to remain true to the original question, however, I’ll focus on the single biggest policy shift necessitated not by outside events but by the new Obama political reality. In his inaugural address, President Obama spoke of his desire to usher in a new era of U.S. diplomatic engagement, encapsulating his philosophy in a single eloquent sentence: “To those who cling to power through corruption and deceit and the silencing of dissent, know that you are on the wrong side of history; but that we will extend a hand if you are willing to unclench your fist.” By making this statement, President Obama began the task of moving past the confrontational dynamic that dominated President Bush’s foreign policy and creating a new dynamic which would in turn create new opportunities for progress. Whether one agreed with President Bush’s policies or not, it was obvious that they had become the status quo, and that many confronted states – including Sudan – had taken reasonably effective steps to insulate themselves from U.S. pressure. By changing the underlying dynamic of how the U.S. deals with problematic states, President Obama sought not only to catalyze new diplomatic processes which might in time yield some progress, but also to regain some potential leverage by weakening the defensive political shields created by Sudan and other regimes to lessen the effects of U.S. diplomatic and economic pressures. In the case of Sudan, this meant first reaching out with a genuine offer of cooperation and improved bilateral relations in exchange for substantive proof of significant government action to improve conditions for civilians in Darfur and elsewhere in Sudan. Should that effort fail due to the Sudanese government’s refusal to take a good (if not perfect, from their perspective) deal when they see one, the very act of President Obama having made a genuine offer will help gain international support for subsequent multilateral diplomatic, economic, and (only if absolutely necessary) military pressures to compel Sudanese cooperation (and in exchange for nothing, from the Sudanese perspective). It is clear that Sudan would be wise to cooperate with President Obama’s new engagement strategy, though it is unclear whether or not they will. It is also worth noting that while the Obama Administration is leading with what we’re calling their “Door 1” engagement option, they are privately well aware of Sudan’s long history of promising lots and delivering nothing. Should Sudan attempt to rhetorically walk through Door 1, but not actually deliver on their part of the deal, the Obama Administration will have no choice but to shift to a stick-driven Door 2 strategy. It is worth reiterating that a genuine U.S. effort at Door 1 will go a long way towards enabling Door 2 multilateral responses if they become necessary. All of this policy and political theory has been made more interesting by the recent public comments of Dr. Ghazi Salahuddin Atabani, the Khartoum government’s lead negotiator with the U.S. on both Darfur and the fragile Comprehensive Peace Agreement which ended the North – South Sudanese civil war. Dr. Atabani’s rhetoric has been all Door 1, and there have been at least some measurable NCP actions (such as easing the movement of humanitarian aid organizations within Darfur) which lend at least a bit of substantive weight to his opening rhetorical flourish. Much remains to be seen as to Khartoum’s true intent – and ability – to walk down the road that lies beyond Door 1. The NCP is not monolithic, and I expect to see plenty of contradictory indicators (such as the now banal vitriol that regularly spews from Presidential Advisor Nafia Ali Nafie) which will muddy attempts to definitively classify the Sudanese government’s true intent as the process moves forward. But what is clear is that the Obama Administration is committed to giving this strategy a shot, both in hopes that it will yield results and as a necessary step toward building the effective multilateral sticks necessary for a proper Door 2 response should Khartoum ultimately reject Door 1. The consequence of this policy shift brought on by the new Obama approach is clear – while the Save Darfur movement must encourage progress and be willing to take yes for an answer should the Door 1 strategy yield sufficient results, we must also be a formidable watchdog, remaining constantly vigilant to ensure that the Obama Administration does not begin to equate NCP promises with actual progress. Only measurable progress on the ground justifies the use of any significant U.S. carrots, though we must understand that progress is not a zero sum game – progress in some areas but not in others will initially be a reason to redouble efforts, not to abandon engagement before it’s had a chance to definitively succeed or fail. Should we eventually reach the point where it’s clear that President Bashir and his regime lack the intention or ability to save themselves by making wholesale changes, the Save Darfur movement should once again refocus its efforts on convincing the U.S. government to compel change in Sudan via much stronger and multilateralized diplomatic, economic, and if necessary military measures than we have seen in recent years. While one might reasonably ask why such an effort would yield better results in the future than it did during the last years of the Bush Administration, it is likely that President Obama would by then have at his disposal much greater multilateral support and available U.S. capacity for stronger actions than did his predecessor for reasons already explained in this post. So to sum up what has already become perhaps too long an answer to a complex question: the new political reality of the Obama Administration demands that the Save Darfur movement adjust where necessary both our advocacy efforts to maintain our political strength and relevance, and our policy prescriptions to remain effective advocates for civilians in Darfur and throughout Sudan. Arriving at the details of how we address both of those sometimes conflicting – but nonetheless interconnected – necessities will for the foreseeable future remain the central subject of our daily work.